Recently I posted a recipe about pesto I made using basil from my garden. If you are a frequent reader then you already know I love all things pesto. Even though pesto and pasta make a terrific meal I wanted to add something more substantial to the dish. My first thought was to add some garlicky chicken, but alas, all our chicken was frozen. The next best thing was garlicky shrimp, especially since shrimp defrost very quickly under cool running water and cook in a flash. For me it was the perfect last minute solution. This recipe cooks up in minutes and has minimal ingredients. If you really want to impress your friends with a dish that is delicious but requires very little work shrimp scampi is your winning ticket. Once cooked you could toss with your favorite pasta or serve as is with a nice crust bread to soak up any left over buttery garlic sauce. Your choice! I added it on top of the pesto pasta and my family thought it was perfect. If you're serving this plain with pasta you could add another tablespoon of butter and oil. Adding red pepper flake to the shrimp would be a nice spicy addition. I left it out because it is too spicy for my little girls. Over medium heat melt the butter in a saute pan. Add garlic cook for 1 minute making sure not to burn. Add shrimp. Turn the shrimp over once they turn pink. Cook until other side turns pink. Season with salt and pepper. Squeeze in the juice of half a lemon. Give everything a good stir then serve. 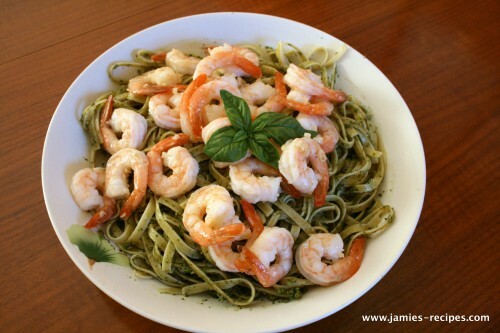 One of my favourite shrimp recipes. Can’t wait to try yours. Miss you! 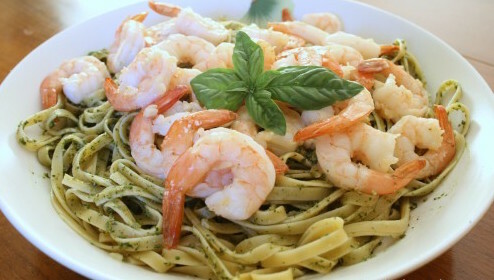 I love shrimp scampi with a glass of nice white wine.